The Football Association wants to test a video assistant referee system from next season's FA Cup third round. The announcement came at the annual meeting of the International Football Association Board (Ifab) on Friday. 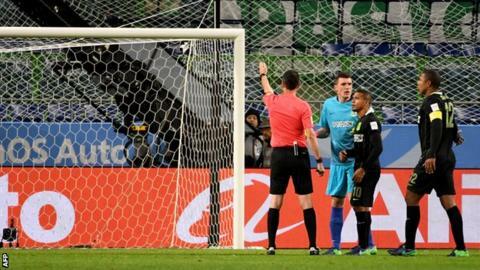 Ifab is also reviewing the order of penalty shootouts, as there is a "clear advantage" to going first. It also confirmed that clubs will be allowed to use a fourth substitute during extra time from the quarter-finals of this season's FA Cup. Proposals for sin-bins for yellow-card offences and rolling substitutions at lower levels of football, to be introduced from June, were also approved at the Wembley meeting. It is a move to "encourage more people to take part" in youth and amateur leagues. Ifab is made up of world governing body Fifa and the four British home associations - the FAs of England, Scotland, Wales and Northern Ireland - and is responsible for deciding on law changes. Friday's meeting, which was chaired by Football Association chief executive Martin Glenn, also agreed a strategy to improve player behaviour. That could lead to captains being the only players permitted to speak to referees about "major incidents". The FA Cup quarter-finals will take place from 11-13 March, including Manchester United's Monday night trip to Premier League leaders Chelsea. The trial of a fourth substitute in extra time is a first in England, though the format was used at last year's Copa America and the Rio Olympics. Glenn said the rule change will bring "extra intrigue and interest" to the ties. "From a technical point of view, it will be interesting to see how managers use the chance to make an additional substitution in such high-profile games and the impact it has on the final result," he added. Fifa president Gianni Infantino attended Friday's meeting and said the aim is for video assistant referees to be used at the World Cup in Russia next year. He confirmed the technology will be used at this June's Confederations Cup and May's Under-20 World Cup. Video assistant referees will review "match-changing" situations before informing the on-field official. Video replays were first used at international level during a friendly between Italy and France in September and then again during an friendly between Italy and Germany in November. The system has been tested in six other countries, including in the third-tier United Soccer League in America and the Dutch Cup. Its first use in a Fifa competition was during December's Club World Cup. Glenn said it would be too early for the technology to be used at August's Community Shield. He added it was a question of "when, not if" the system is introduced to English football. Ifab is considering changing penalty shootouts, citing the example of a tennis tie-break to combat the "statistically proven advantage" of the team that goes first. Teams alternate in shootouts, but Ifab says research shows the first team taking kicks has a 60% chance of winning. It is seeking trials in the lower levels of football that would see one team take the first penalty, then the teams alternate two kicks at a time. "We believe that approach could remove that statistical bias and this is something that we will now look to trial," said Scottish FA chief executive Stewart Regan. The game's global lawmakers say they want to improve player behaviour and give referees a helping hand. Team captains will be asked to take on a greater leadership role, something the Premier League has encouraged for a number of years. The men and women who stand guard over football's law have approved a package of measures including sin-bins for yellow-card offences in amateur football. A greater use of technology is planned, sensors to determine if a goal has been scored are already in use, but experiments with video replays will now be extended to decide other contentious decisions. Many sports such as rugby have a long established culture of respect, now football wants to follow suit. Respect is a much-used word within football, the game's guardians hope their changes will make it more of a reality at every level.